Ambiflex controllers are specifically designed and manufactured as high quality, flexible and reliable systems providing the very latest in energy management and control innovation. 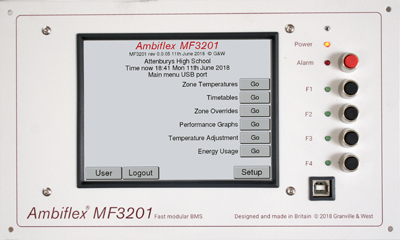 The Ambiflex MF3200 range of controllers (3200 & 3201) combine competitive pricing with ease of use for non-technical personnel, ensuring that even the more modest buildings can now benefit from the advantages of a Building Management System. The MF3201 is a freely programmable, micro-processor based touch screen controller capable of operating standalone or as part of a network. All Building Management System (BMS) features of energy management, control, data logging, alarm/event monitoring and remote communications are resident within the MF3200.